Barcelona, February 21, 2019: At the 2019 Mobile World Congress (MWC) in Barcelona, Continental and Vodafone will showcase the first results of their innovation partnership and demonstrate how new communication technologies can prevent thousands of accidents every year. Last summer, the partners announced that they would be working together to increase road safety. The first results confirm this – state-of-the-art communications technologies such as 5G, cellular vehicle-to-everything (C-V2X) and mobile edge computing help to better protect all road users. 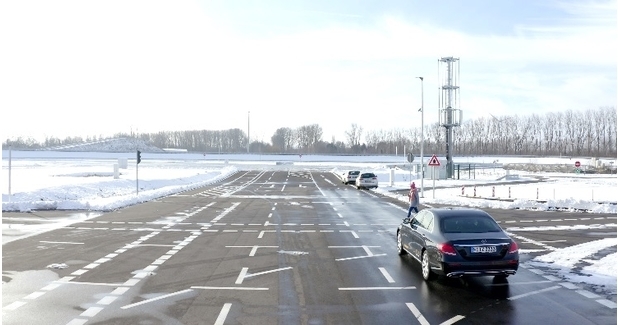 The 5G-ready tests are taking place under real-life conditions at Vodafone’s 5G Mobility Lab in Aldenhoven, Germany. A start of series production based on these technologies is planned for the beginning of the 2020s. “Our vision of a world without traffic fatalities, without accidents and without traffic jams is increasingly becoming reality. Following successful tests with our partner Continental, there could be cars on our streets that offer all road users more safety from as early as the beginning of the 2020s. Cars will become smartphones on wheels, with sensors and cameras that communicate in real time via mobile communications, warn of dangers and protect us,” says Hannes Ametsreiter, CEO, Vodafone Germany. Mobile edge computing also relieves computing capacities in the vehicle and the higher-level data centres. It also renders expensive chipsets in vehicles unnecessary. “We have tested this system in the 5G Mobility Lab and the results are promising,” explains Hiebl. Furthermore, the tests confirmed that the new communication technologies can also be used to make visible visual obstructions in road traffic. The system uses the camera footage from a vehicle in front to alert the following vehicles of oncoming traffic. Another application presented by Continental and Vodafone in Barcelona is a traffic jam warning system. Vehicles approaching the end of a traffic jam are notified of the obstacle long before they reach it. In this way, speed can be reduced sooner and dangerous emergency braking can be prevented. Many of these functions tested by Vodafone and Continental can already be implemented with the existing LTE network, which allows higher data transmission rates through planned extensions. Developers are talking about LTE Advanced or 4.5G, and are calling their solutions 5G-ready. In the future, LTE and 5G technologies will complement each other in road traffic as best as possible, to enable time-critical communication between vehicles.